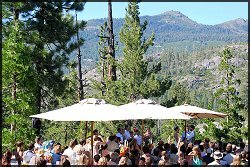 The following list of special event locations w/links and descriptions are Mountain Magic's preferred venues. 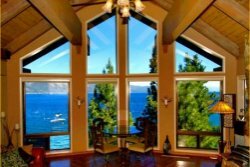 From this list the surrounding Lake Tahoe - Truckee area also offers countless vacation rental properties and beaches that might be perfect for your vision. 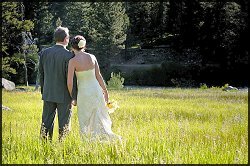 Give Mountain Magic a call for current pricing and contact information. NEW! 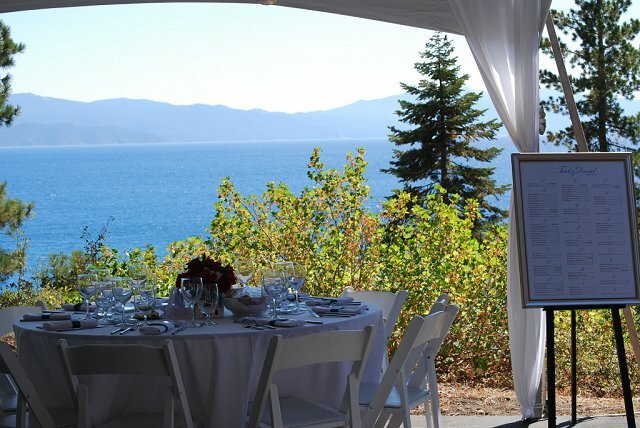 Favorable located on Lake Tahoe's West Shore, The established Tahoe Maritime Museum, also home of the Tahoe Tree Company spans 10 acres of native plants, shrubs, mature trees and yes, flowers. 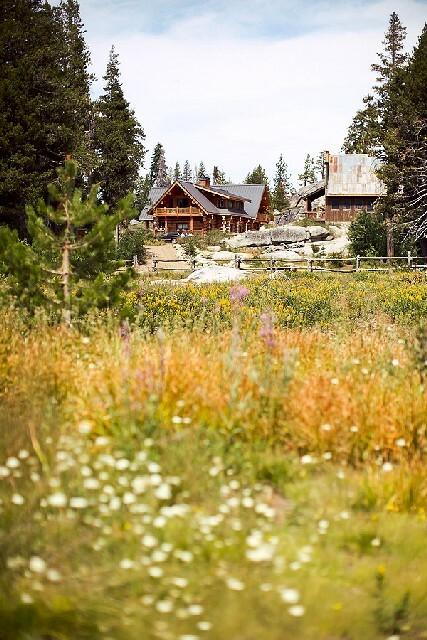 The 6,500 square ft. Museum Lodge with its handsome timber construction evokes the welcoming yet rustic Tahoe feel. The lodge and grounds house Maritime wooden boat exhibits and historical art exhibitions. Nestled in a private corner of the property is the Garden Gazebo with its secluded oasis setting for ceremonies and outdoor reception tiered crushed granite terraces. 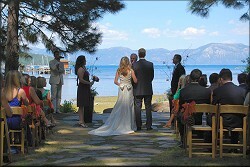 Custom garden designs are available for both ceremony and receptions. 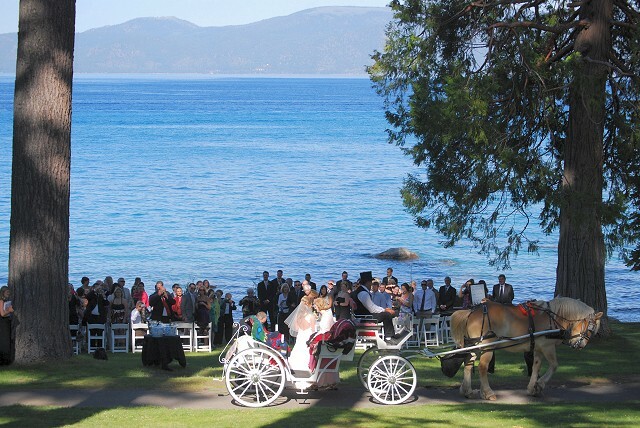 Spring, Summer and Fall offer the full glory of the Lake Tahoe Maritime Museum offering a complete and unparalleled West Shore venue for receptions up to 200 guests. The Museum grounds are also ideal for any special family or corporate events. 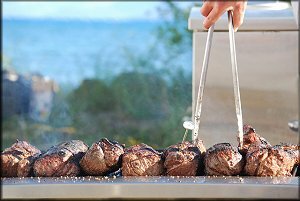 The Museum lodge is home to Mountain Magic and its commercial kitchen for preferred on site catering options. 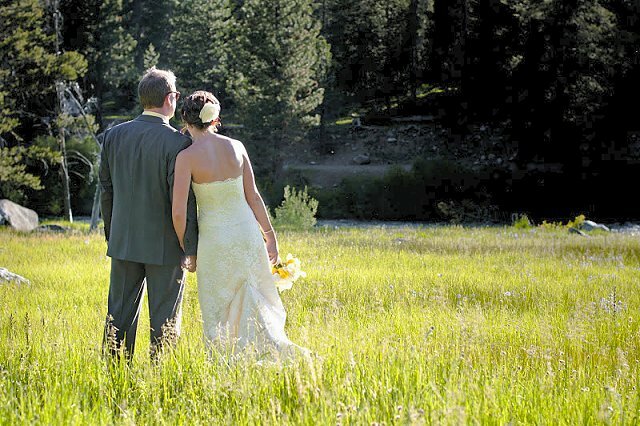 Situated between Squaw Valley and Alpine Meadows ski resorts. 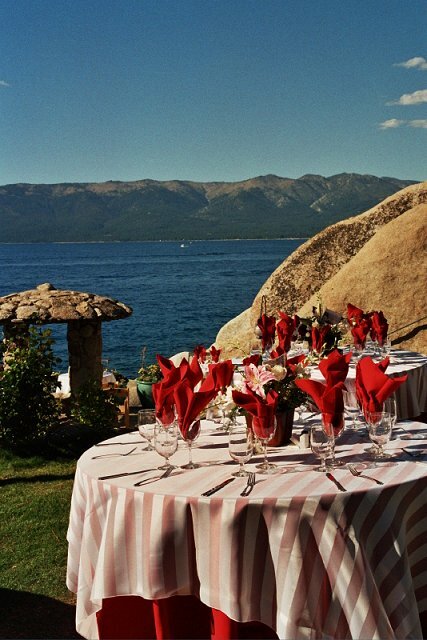 Glacier polished granite looms above the property surrounding a pristine lake and adjacent reception area. Complete with built in bar "Peace Pipe Peak Pub" and stage! 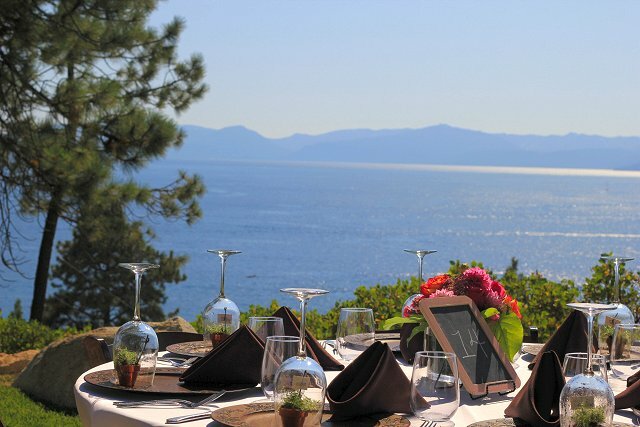 The property is certainly unique offering a tranquil Alpine setting on exclusive private land. 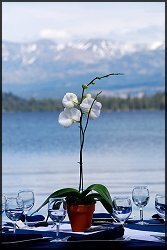 Open once again for outdoor lake view receptions. The Mansion was a summer home built in 1903 and is now managed as a museum by the State of California. 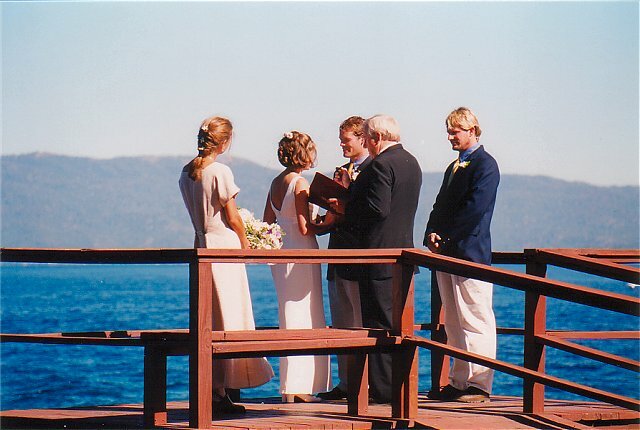 The reception area/mansion sits in the center of Sugar Pine Point State Park with expansive lake views, a public pier and nearly two miles of lake frontage. Permit fees are based on usage and average $2,000.00. Tahoe City's Gatekeepers Lodge is located next to the newly remodeled Lake Tahoe spillway and fanny bridge. 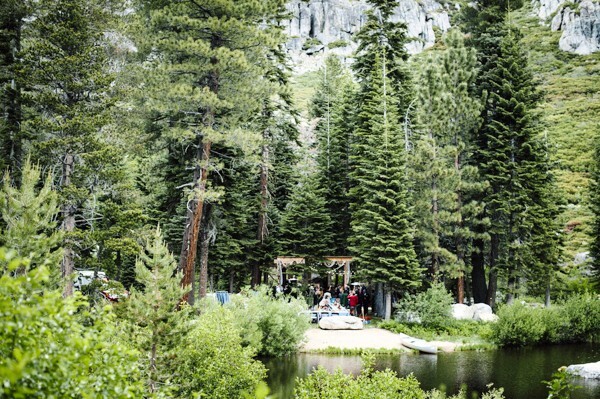 The 3-acre grounds offer secluded lakeside weddings at a unique price point. 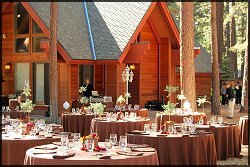 Layton park is operated by the North lake Tahoe historical society offering a rustic out door venue for receptions up to 300 guests. 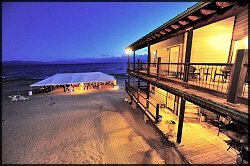 Located on the sandy North Shore beach in Kings Beach. 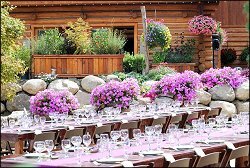 The event center can accommodate weddings and private events for up to 400 guests and has many layout options for much smaller parties. 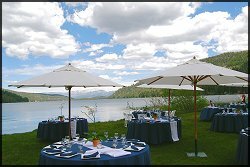 The lakeside patio is steps from the lake and can offer a perfect backdrop for your special event or reception. 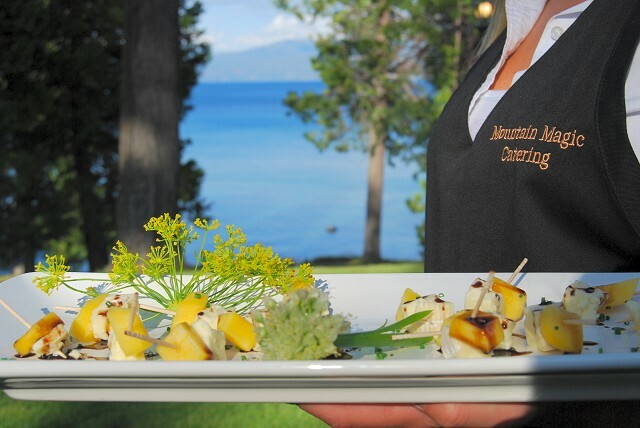 After many years of an exclusive in house catering program the center now welcomes the creativity of outside vendors like Mountain Magic Catering. 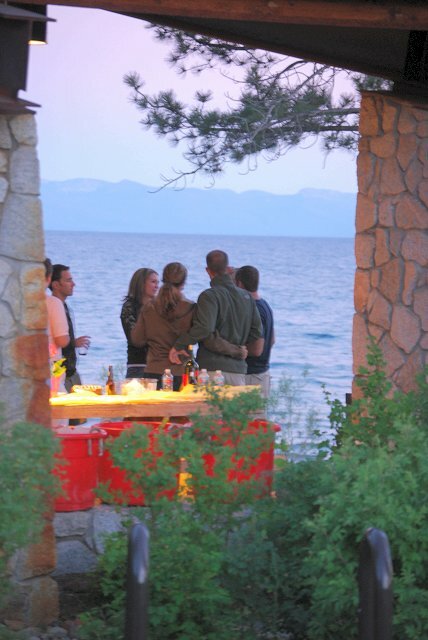 Perched on a point overlooking the aqua marine waters of Meeks Bay the Kehlet Mansion is a rustic Tahoe oasis. 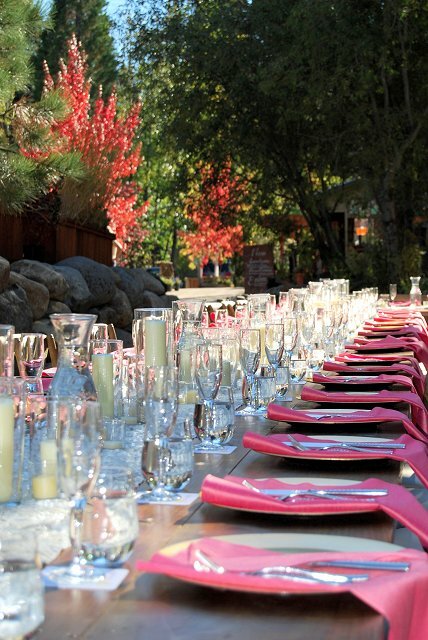 The home is a perfect staging area for outdoor receptions. The bridal party can stay on site with additional lodging and log cabins at the resort. 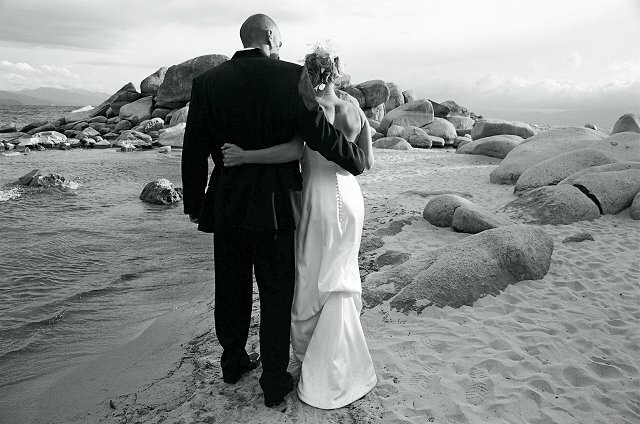 This location is one your guests and family will remember for its simple beauty. 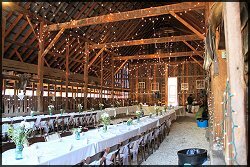 Reception area can either be tented or open air. 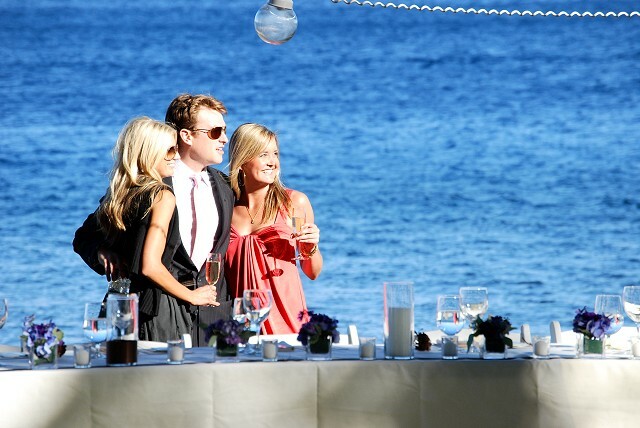 The property offers a unique pier overlooking the water absolutely stunning for ceremonies and photo opportunities. 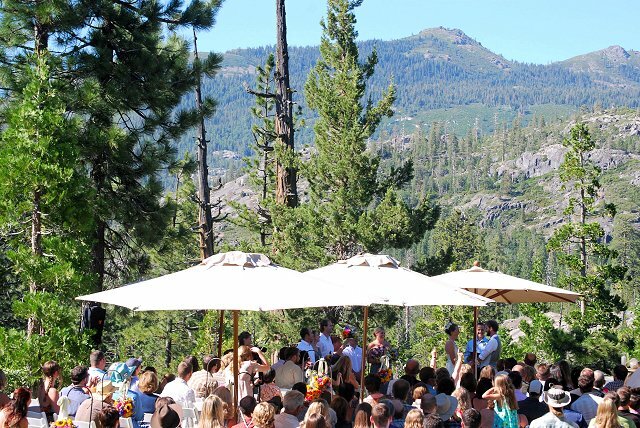 One of a kind Sierra Mountain wedding site with close proximity to Truckee and Lake Tahoe. 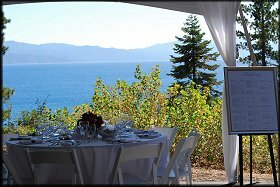 The expansive property and cabin offers a very private outdoor setting without the restrictions we find limiting in the Tahoe area. Visit the website for complete details and photos. 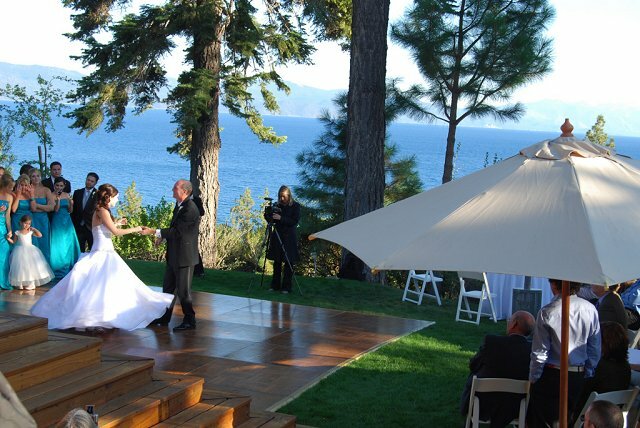 The Pavilion on the point is a picturesque lakeside venue for your wedding reception, rehearsal or family reunion. 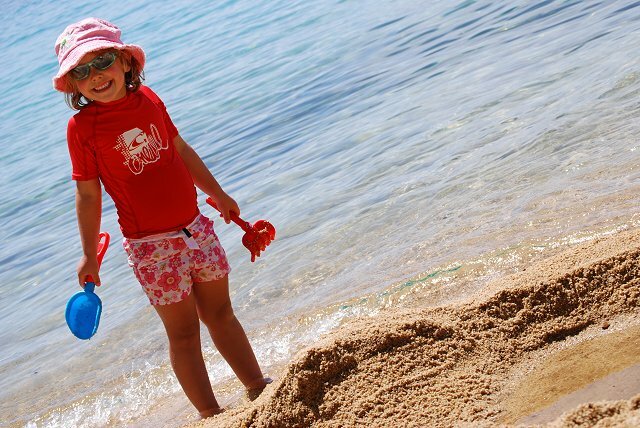 The large grassed group area and beach has been a locals choice. 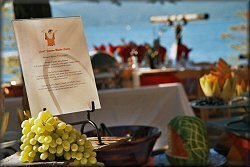 The level lakeside setting offers many options for set up including possible tenting and arranging for complete rentals of additional tables, chairs etc. 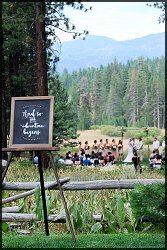 For further information and availability call the Truckee Donner Recreation department office at 530 582-7720. 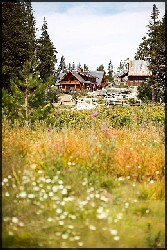 Historical Squaw Valley Stables located in Olympic Valley offers a Sierra air view of the ski area and wild flower meadow. 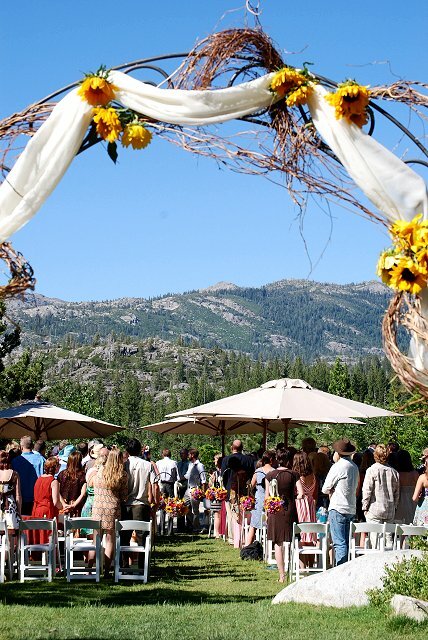 The Ranch style property is an outdoor and rustic venue in the heart of Squaw Valley with immediate access to the valley's lodging amenities, complete resort activities and minutes from Lake Tahoe's North and West shores. 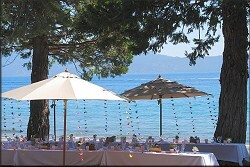 The property is level and easily accessible for tenting of reception parties up to 300 guests. 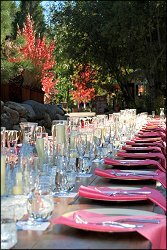 The memory of what was once a very bustling wrangler operation lives-on with the Valleys' only private reception venue. 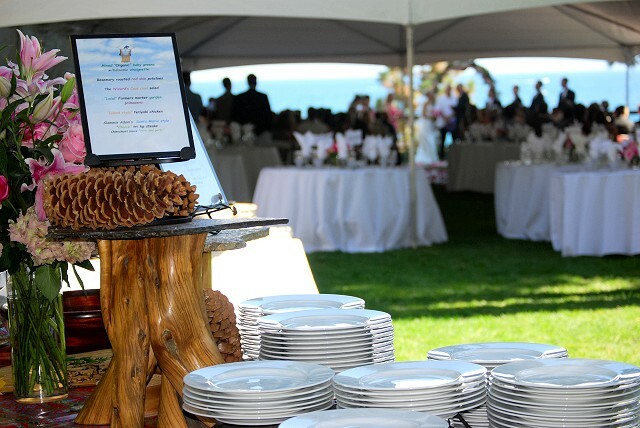 The freedom to create your unique reception feel is open. When looking for an extraordinary location to host your special event, look no further than the historic Thunderbird Lodge. The magical six-acre waterfront estate, unparalleled in beauty, is a rare Lake Tahoe treasure. 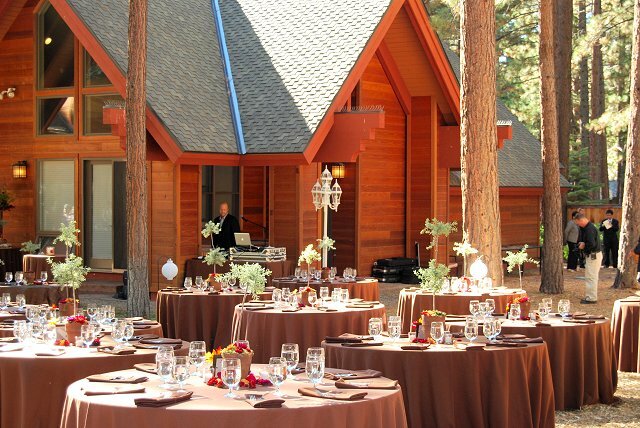 From the three story waterfall that cascades past the granite boulders in front of the Old Lodge, to the six hundred foot long tunnel and secret passageways, the Thunderbird Lodge is sure to intrigue even the most seasoned wedding and event guest. 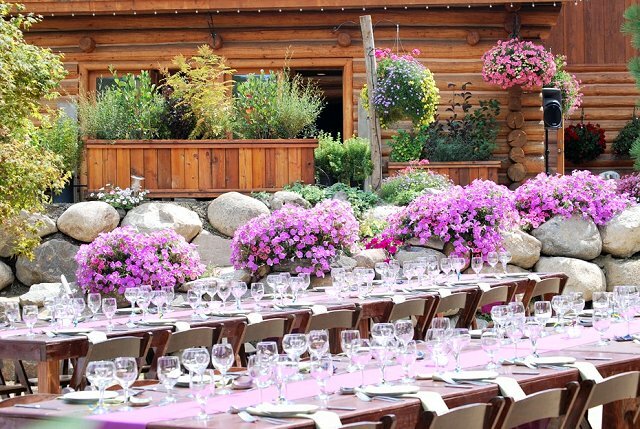 Meticulously assembled by dozens of craftsmen - Cornish miners, Italian ironworkers, Scandinavian carpenters and Native American stonemasons - the Lodge is truly a one-of-a-kind site that will make your event exceptionally memorable. 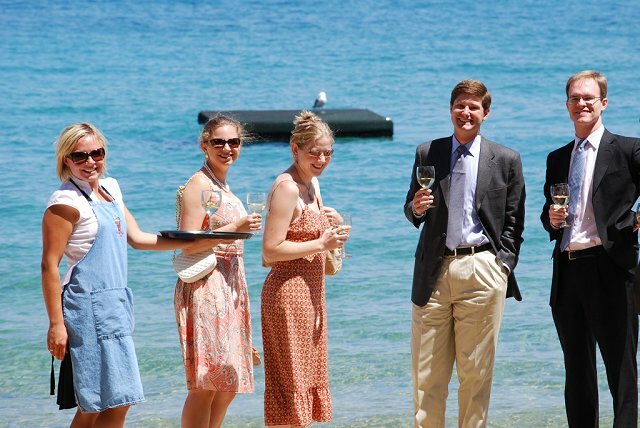 Delight your guests with a complimentary guided tour of the Thunderbird Lodge. The Lodge's owner, George Whittell Jr., had near unlimited wealth in the post Depression era and spared no expense in the construction of his whimsical "Lake Cottage". At one time, Whittell owned 1/3 of Lake Tahoe's shoreline and the surrounding 40,000 acres. Stories abound of his infamous, high stakes poker games which he hosted in the estate's Card House and the chorus girls that he secreted in through the tunnel to entertain his guests. 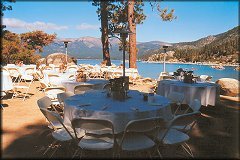 His pet lion Bill maintains his own notoriety in Lake Tahoe's history. 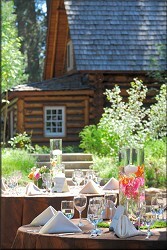 The Thunderbird Lodge offers over 3,000 square feet of interior space. The surrounding grounds include a lakeside lawn, two patios, a gazebo, and a private sandy lagoon connected by stone pathways. 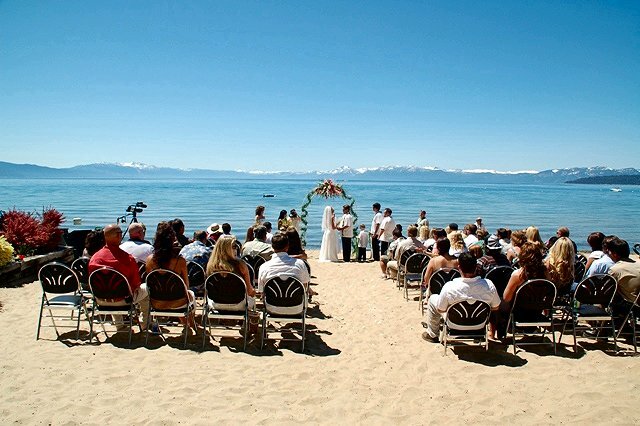 Located in Tahoe Vista on the sandy North Shore beaches Mourelatos Lakeshore Resort offers an ideal location for a destination Lake Tahoe reception and ceremony. 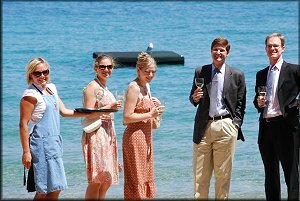 The resort offers guest lodging and allows for outdoor reception parties when the wedding party reserves the Lakeview guest rooms. Outdoor tenting either on the beach or in the courtyard area is the best scenario. 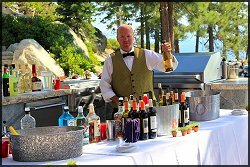 Considering the advance reservations needed and annual returning guests, the best time to plan a reception with this property is in the early fall/Indian summer or early June before the summer tourism season is upon us. 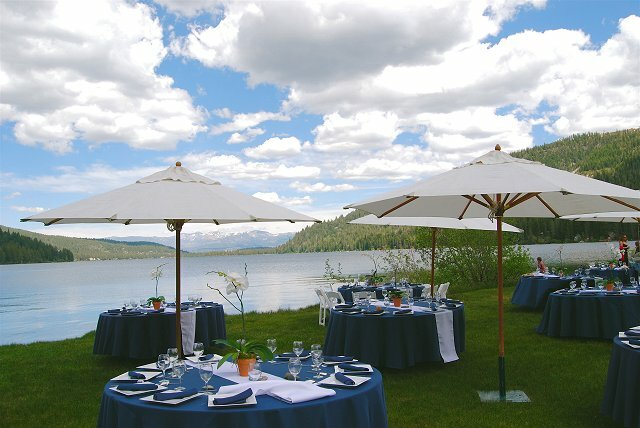 Private lakeside home with landscaped grounds perfect for larger receptions that can easily be tented. 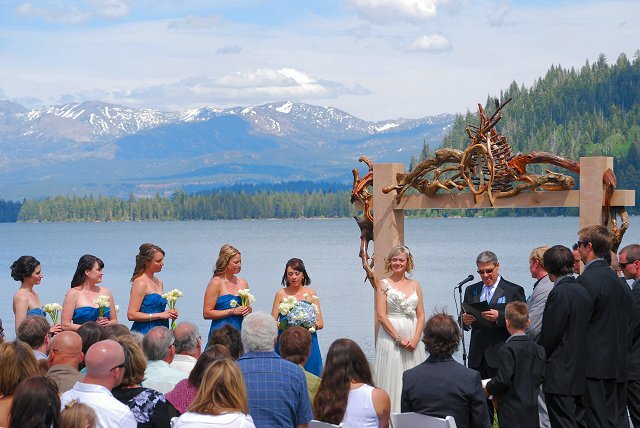 Give Mountain Magic a call for more information on rentals and availability. 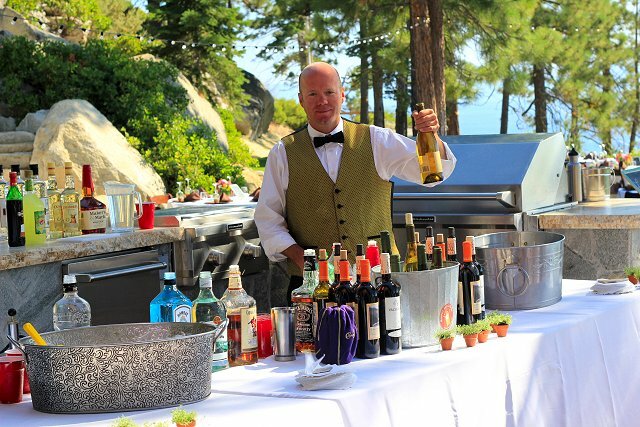 Situated on 3 lakefront acres that are covered with 42' pine trees, fir trees, giant boulders and outcroppings of granite, Fairwinds is the ultimate destination for a special celebration. 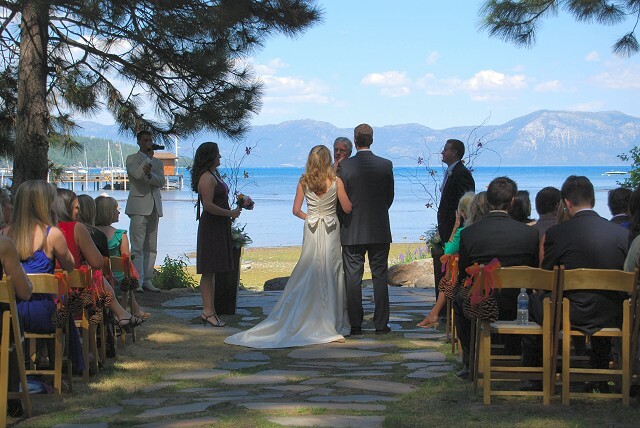 At Fairwinds, whether you take in the panoramic vistas from their arching living room window, their spacious deck, or their private sandy beach on the Lake, the best of Tahoe's scenic beauty is yours at this rustic and charming facility. Originally constructed in 1934 and still containing its original Monterey Furniture, Fairwinds has the perfect feel of another time, another place. You and your special guests will feel right at home. 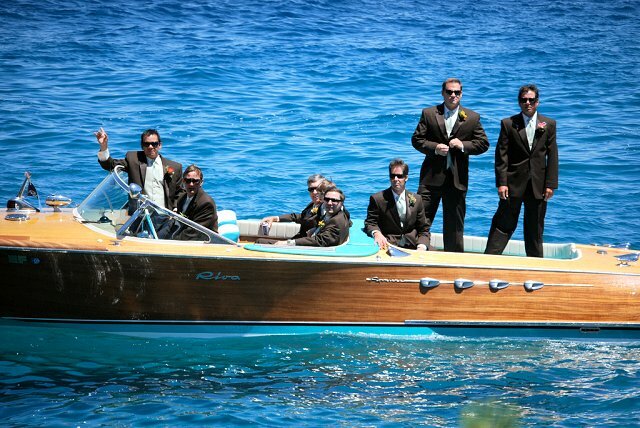 Fairwinds has 6,000 square feet of wonderful reception space, its own dock for up to four boats, and sleeping arrangements for over thirty special guests. 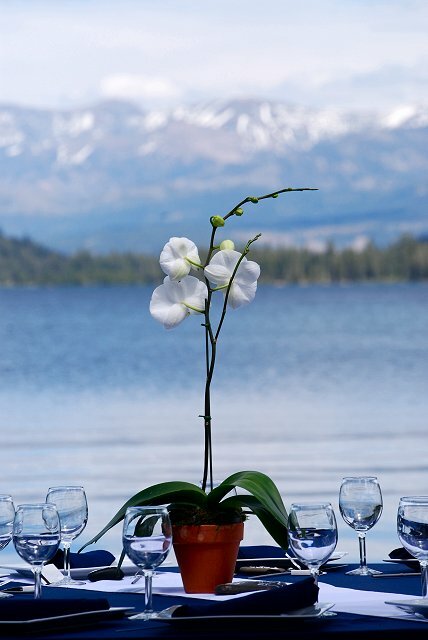 Countless Lake Tahoe activities are just minutes away in any direction. 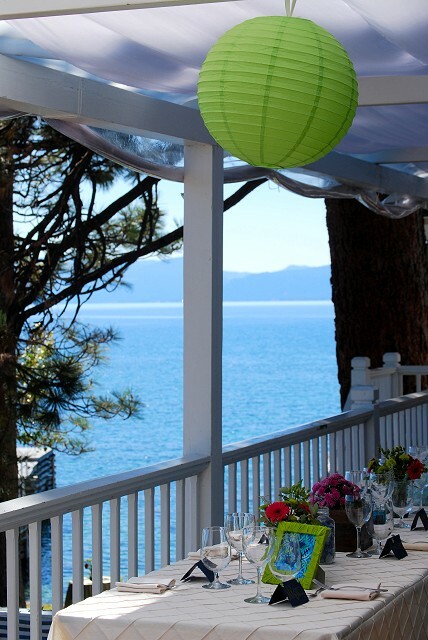 Overlooking the Tahoe City marina and Lake Tahoe’s waters the Yacht Club offers incredible views down the west shore. The handsome clubhouse has a massive fireplace and mahogany bar as its focal points. 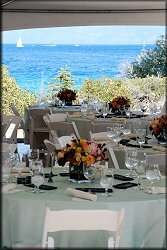 The club although private does offer reasonable event rentals and will accommodate groups/receptions of up to 80 guests for a seated dinner or up to 125 for a cocktail reception or party. The beautiful mountain lawn and deck located under the majestic “Tram Face” of Squaw can accommodate up to 150 for receptions. 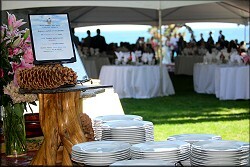 The Gallery can hold receptions for up to 50 people. 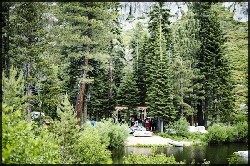 A mountain Park setting at the base of Alpine meadows valley. 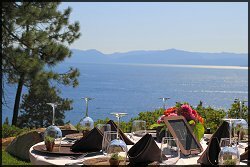 Available for large groupsNo reservations available in July and August. June Sept, and October are appropriate months. 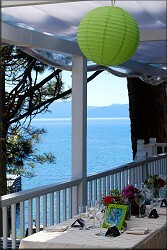 Lake Tahoe Deluxe offers vacation rentals with some unique homes suitable for smaller receptions and family rentals. Search the listings for current rentals available. 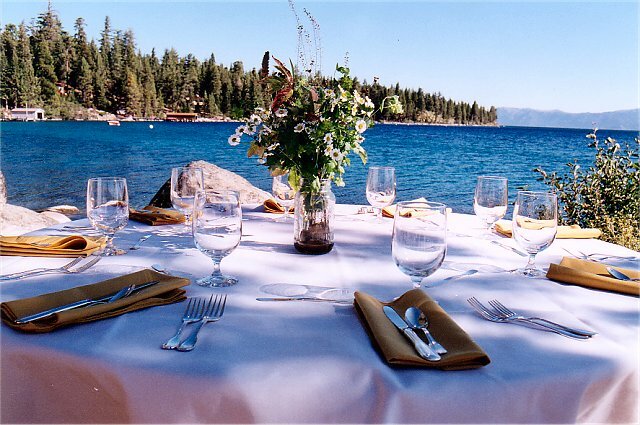 Listing private properties and vacation homes throughout Lake Tahoe and the surrounding areas. Some of the larger properties offer a perfect option for receptions and family rentals that can accommodate rehearsals and post reception brunches in both the summer and winter months. 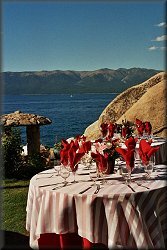 A lakeside group area Gazebo in the stunning Sand Harbor State Park. 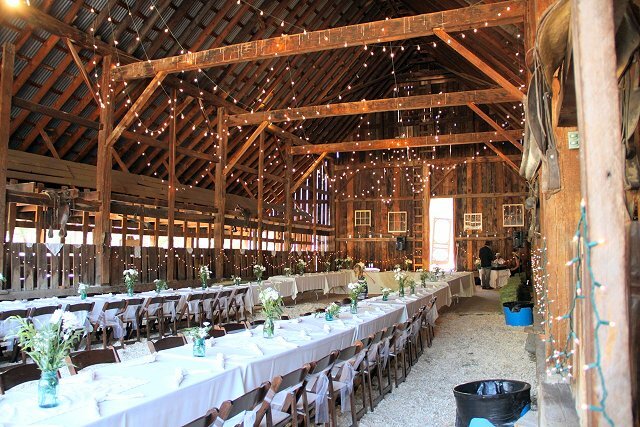 This location books quickly for summer and fall family gatherings, rehearsals and casual receptions. Contact the North Tahoe PUD for Lakefront beaches and parks on the North Shore with perfect group areas for rehearsals, post reception brunches and casual receptions. 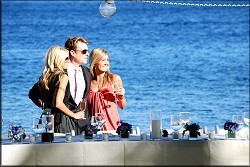 The main lodge, a 5,000 sq ft. masterpiece, has 5 bedroom suites, two kitchens and decks that sit right on the water. Behind it, the Saloon serves as the entertainment center with its old-western style bar on the main floor and two more bedrooms upstairs. 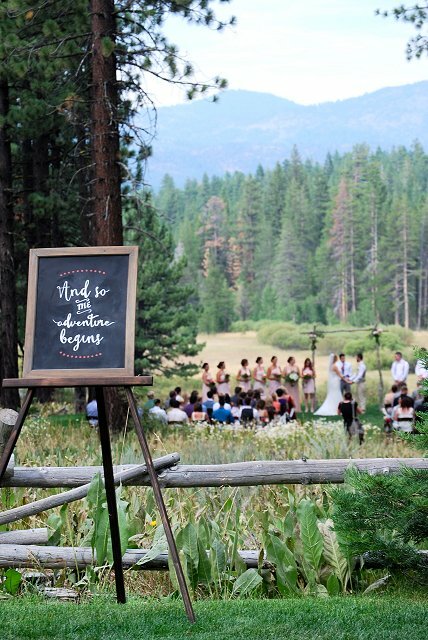 With 40 acres of pristine mountain landscape at your fingertips, you're free to design the wedding of your dreams and hold it all in one extraordinary setting.